This morning I am having a piece of mocha cheesecake for breakfast, along with my cup of coffee. What a way to start a Monday! I recommend it. At 330 calories a slice, this is actually doable, a recipe from my friend’s cookbook. This is what I am giving away. Let me tell you a bit more about it. Here is a link to the book, along with resource lists, some recipes, and words from the author. A few years ago, Esther and her husband started a long, grueling journey to find solutions for their little daughter who had been diagnosed with absence seizures. During a period of trying one medication after another, they were discouraged to see no real progress and the side effects of the drugs had changed their little girl into someone they scarcely recognized. Around that time their doctor broached the subject of trying a radical diet change to see whether it would improve her quality of life. He explained to them that some epilepsy sufferers have seen significant improvement when they eat a low glycemic index diet, which is a carbohydrate-controlled diet, using only low glycemic carbs with an emphasis on fats and proteins. The glycemic index ranks foods and beverages based on how they affect your blood sugar level. It was a huge, scary shift for the Yoders, but they were willing to do anything to help their daughter. Esther has described to me how her life was completely overwhelmed with the need to figure out foods that her little girl could eat and actually enjoy. She worked carefully with the doctor and a dietician, spending entire days developing recipes and tweaking them until they were delicious. I can personally attest to this, as I have been using recipes from her cookbook this past week. My friend knows how to cook! All the hard work paid off when they found that after only three months, the seizures were gone and the medications were being slowly tapered off by the doctor. They became committed to the diet for the long haul, and Andria is now seizure free, off all meds. Nutritious food became her medicine. The cookbook is beautifully done, with serving sizes and nutrition information included in every recipe. I enjoy just paging through and looking at the gorgeous photos. 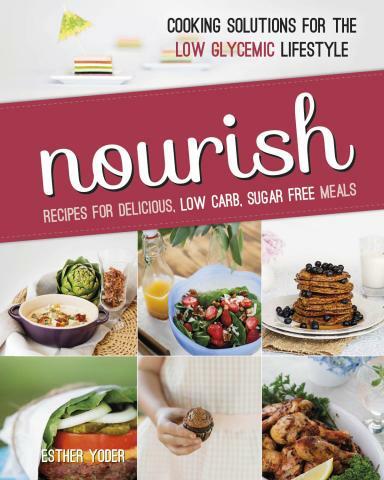 This book is a labor of love and encouragement to anyone who faces the gigantic shift of a lifestyle change with their eating habits, especially the low glycemic index diet. This is typically recommended for folks with diabetes as well as a sustainable weight loss plan. For the Trim Healthy Mama crowd, these recipes are actually quite similar to THM. Looks like a wonderful cookbook! Would love to win! Our daughter-in-law is experiencing a hormonal breakdown and is searching for a new way to eat, and this sounds like something she would love to have. This experience is showinf me how great our God is and how intricate He has made us. Blessings to you for bringing Him glory through your hard times. i would love to try this book. This is a cookbook I’d be very interested in!! I’m becoming more and more convinced that a low-glycemic diet is more healthy than the one we usually embrace–which is full of sugar and white flour and potatoes. We could probably avoid many problems with a lower glycemic diet. ..would love to have this….I’m trying to regulate my blood sugars …am finding it hard to find something that works. I would love to have this cookbook and start cooking/baking this way! i would like this book so i could make things that are good with no sugar or less sugar. I’m always on the lookout for fresh inspiration on healthy cooking, so this book would totally intrigue me! Wow,I can’t imagine the hours Esther must have put in this book! Good job on advertising it for her. :) I’ll try to do my part and share it on FB as well. And btw, I’d LOVE to win! looks exciting! love new cookbooks! Would love to win, enjoy all cookbooks. I WANT this book!! Ive been hearing about its coming for awhile now! I would love to share this cookbook with a friend whose daughter was just diagnosed with epilepsy. A little over two weeks ago, our four-year-old daughter was diagnosed with epilepsy. She has become a stranger on the drugs. We are still adjusting to the shock of the diagnosis, so it’s too soon to upend my kitchen in such a radical way. But in time, if the way I cook could help our daughter live seizure-free without drugs, I would be willing to try the low glycemic index diet. It looks a little easier than the ketogenic diet, another method of treating epilepsy with food. Right now, Andria’s story–and her mother’s search for answers–will mean as much to me as the recipes.